For the longest time, the only thing we really noticed on the trips down Hwy 68 was this odd structure on the north side of the road as we neared Mankato. Many students had many strange and spooky stories about the structure, but one thing was clear: it was an old decaying structure that vandals seemed to enjoy vandalizing. Depending on the time you have, you can either drive all the way to the windmill and park in the lot there, or you might want to park at any of the trailheads, and hike to the windmill and back. 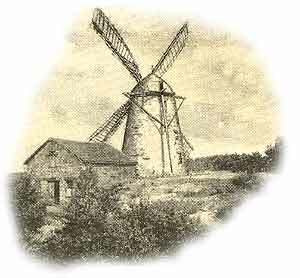 One you get to the windmill, take the time to read the history and enjoy the view. Then go down the small steps to the front of the storage building. From the southwest corner of this building, go about 40 steps at 287 degrees along a wide open green path (used for park trucks?). Then look behind the large tree on your right at the edge of the tree line. The box is there under a rock and some forest debris. Please re-hide accordingly.